You see, I have never been a public school teacher. But I was once behind the lens, interviewing public school teachers, listening for inspiring sound bites that I? ?might ??share? ?to the viewing public. I met the? ?se teachers? ?in the mountains,? ?on ? ?remote islands and? ?across? ?far-flung barangays. Each? ?willing to traverse dangerous seas and rivers,? ?just to teach. As I shared their stories? ?on TV, all these public school teachers from different parts of the country inspired so many. But in the end, the person they? ?most? ?moved was…me. An opportunity came when I learned about Teach for the Philippines. Teach for the Philippines is a non-profit organization that recruits, selects, and trains promising young Filipino leaders to teach for two? ?-? ?years inside public schools. And I thought…this might? ?be the chance I have been waiting for. So I took the leap, left my job in media and joined T?each for the Philippines?. We are called Teacher Fellows?,? ?each ?coming to the table with a diverse background. Some are nurses, engineers, or journalists ?– and ?all ?are ?willing to take up the challenge of teaching in a public school. 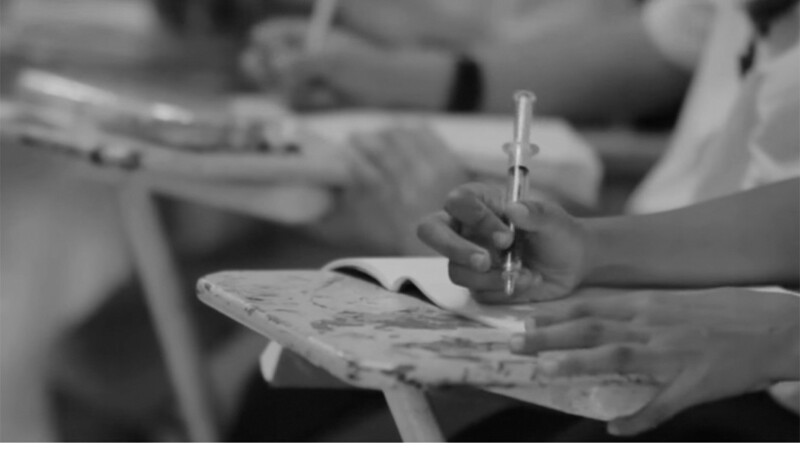 With or without teaching experience, we were accepted because of our passion, our grit and a strong desire to provide Filipino children with an inclusive, relevant, and excellent education. And that summer of 2015 during our Summer Institute, my name was finally called. To go or not to go, that was the question. Should I leave my ailing father behind? Can I bear to work so far away from my friends and family? Together with co-fellows Bryan Mangahas and Arnikan Abueva, we were first timers on an island we barely knew…and in a town that we will soon call our second home for two years. 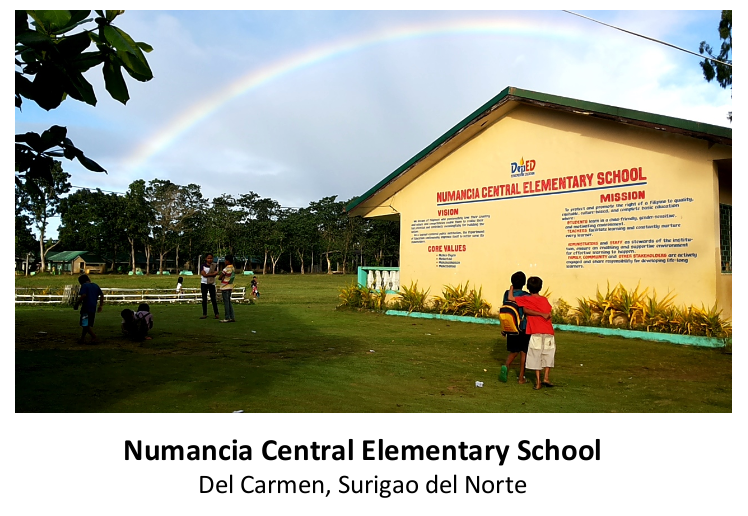 Welcome to Numancia Central Elementary School… located in the heart of the mangrove town of Del Carmen in Siargao Islands, Surigao del Norte. We were miles and miles away from home. During my first year, I ?was an English and Science teacher to grade IV students. My co-fellows, Arni and Bryan, taught the grade five and grade six classes?,? respectively. And this time, I was not behind the camera. I was in front of the classroom. There was no script?, just ?a lesson plan. The students ?were now my audience. As I ?stepped? into my first class, the experience was unnerving. Will they like me? Should I smile? They say first impressions last. Whether it was good or bad, I ?had to keep going. The responsibility of shaping so many hearts and minds was overwhelming. I had the power to make or break a dream. As any public school teacher, I also faced the lack of books and school supplies, unmotivated and rowdy students, and pupils absent for days ?and weeks? at a time?. ? ?I tried to reach out to my slow learners, repeaters, over-aged students and even a girl with a physical handicap. ?There were times they wouldn’t listen or ?would ?cut class. They? woul?d bully each other and things ?would get out of control. ?There were times their minds would ?be elsewhere? — on the beach, in the farm.? ?Like the waves that surrounded our little island, there were ?definitely ?high and lows. In the midst of my frustration, I wondered why. Was it me? It tested my patience, my leadership, and my resourcefulness. And I learned to seek help from my co-teacher?s?, co-fellows and TFP family. It is hard work…a continuous learning process and we are not alone. As I got to know my pupils one by one, I ?started to bec?o?me their student. My co-fellows and I slowly learned the Surigaonon language, and their culture. Did you know that Surigaonon for tomorrow is silom? And they call a cat, miya, and a dog, ido? Did you know that they believed in the “Ayuk,” a supernatural being that goes out to kill at night? But behind the charm and quirks of a town are families struggling to put food in the table. Being in a fifth class municipality of Del Carmen, some of our students face a life of poverty outside school. Most of them are sons and daughters of farmers, laborers, and fishermen. Some of our students have no choice but to help their families by selling shellfish, pasayan (shrimps), lato (seaweeds) or anything their fathers would catch from the bounty of the sea. Yes, they would miss classes. But can I really keep them out of the streets? In order to understand, I ?returned to skills from my first career — doing interviews. I visit?ed? my poorest and most vulnerable kids by boat or by bike in the outskirts of the town. No matter how hopeless they ?thought their situations ?we?re, I want?ed? the parents to know this is how much we cared for the education of their children and that we should work together. One of my grade IV students, Mark D?. ?, would wake up very early in the morning, to walk around the community, shouting “Pasayan! Pasayan!” (shrimps) at the top of his lungs. I’d buy his shrimps, at first out of pity… because I wanted him to get to school soon. Knowing each of their stories, I was able to teach my students better. I listened more to a community that lives and breathes on its own. Now that I knew their “whys, ” I discovered their dreams. And this answered ?my own “whys,” ?the purpose ?for ?why we were ?assigned here. I learned to teach not just by looking at a blank sea of faces. For in my lenses, I s?aw? a future pilot, a nurse, an engineer, or a teacher. I learned to move the spotlight away from myself ?and onto my students so they ?could shine. Because in the public school where you can see slices of society’s ills, there is a pot of gold waiting to be discovered. When my father died last December due to cardiac arrest, I questioned my own decisions. I was so far away. I felt useless. I was not only a teacher. I was a daughter who chose service to the community over her own family. I ?felt guilty. But knowing my dad, I knew he? would? be very proud of me. I honor?ed? him by succeeding and by finishing what I started. Often, I ?would tell my students, they are worth every sacrifice we teachers have to make. Even if we have own personal struggles our students will always be worth it. Even if they live in shanties, they deserve an equal chance. The goodness we impart as teachers ripple throughout generations. It breaks the cycle of poverty. Together with the community, we can succeed in transforming the country’s public school system the best it can be. My grade IV students may not have much. There are things that some simply couldn’t have…a bag, a pencil, or a new uniform. But I know in the future they will make waves, bigger than what we see in their island. For what they have are teachers with a heart. And that makes all the difference. Teaching is love made visible.